The first two months of 1884 had brought nearly ceaseless rain to much of the United States. Slate gray rain clouds had cast a pall over the land, blotting out what little late-winter sun there was to be had and inundating the already soggy ground. Grass and dirt turned to sloppy mud. Rivers and streams, swollen from the relentless precipitation, bulged and spilled over their banks. Meandering creeks transformed into raging rivers, major rivers into vast inland seas. For the first time in many days, the morning of February 19 brought a welcome respite. Morning broke to fair weather and mostly cloudless skies, and many engorged rivers began to slowly recede. A broad, deep low pressure system was tracking across the upper Mississippi Valley just south of the Great Lakes, pulling in air from the south ahead of it. A strong southerly wind drawn from the Gulf of Mexico overspread the south with warm, soupy air. In Alabama, temperatures surged by ten degrees in the span of a few hours. In Mississippi, temperatures jumped nearly 20 degrees. Dewpoints rocketed to the mid- and upper-60s as winter-weary residents headed out to enjoy the springlike weather. Several hundred miles to the northwest, the story was much different. Trailing behind the low pressure system was a bitterly cold air mass, dragged down from high in the Arctic. Temperatures dropped by as much as 30 degrees in 24 hours with the passage of the cold front, bottoming out below zero in many places. Surface chart from 7am. Strong southerly flow was evident ahead and south of the low, setting up a broad warm sector. Red “++++” icons indicate tornado tracks recorded in the following eight hours. Surface chart from 3pm. Surface temperatures ranging from 60 to 75 degrees overspread much of the eastern United States ahead of the deepening low. Ground observations indicate temperatures in excess of 75 degrees actually reached as far inland as Kentucky and western Virginia. Surface chart from 11pm. Enhanced low-level winds south and east of the rapidly deepening low, along with ample moisture, allowed for continued tornado production through the evening and overnight. 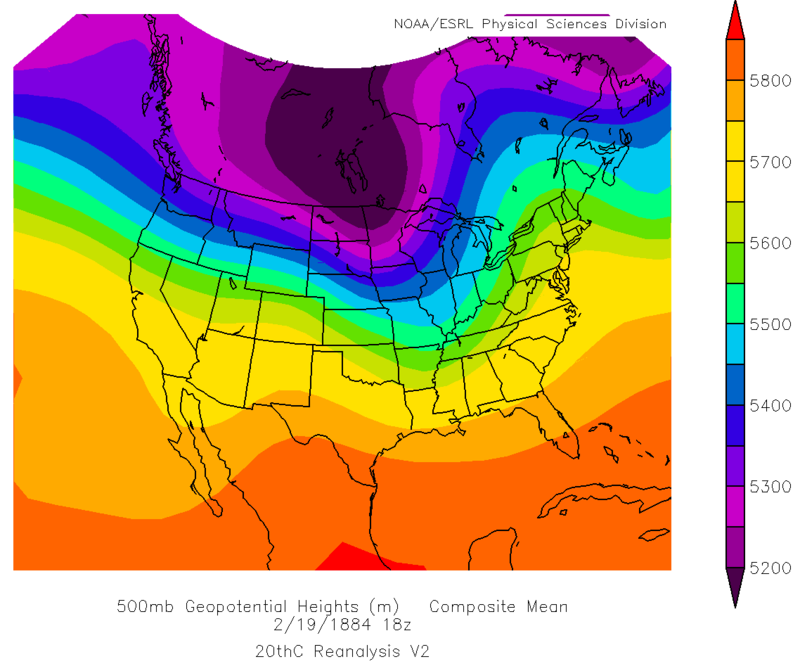 The negatively-tilted trough can be clearly seen on the 500mb map from noon on February 19. A negatively-tilted trough dug southeast across the North-Central United States, while the core of an intense jet streak rapidly rounded its base. Adding to the already dangerous situation, a bulge of extremely dry air from the west began to nose in on the layer of deep moisture over the Southeast. While winds at the surface blew stiffly from the south and southeast, winds at mid-levels howled from the southwest and upper-level winds blew west to west-northwest. Additionally, wind speeds increased substantially with height throughout the atmosphere. The resulting directional and speed shear, combined with the high instability of the warm, oppressive airmass below and the dry air from the west, created ideal conditions for supercells and tornadoes over a broad area. By mid-morning, cauliflower-shaped thunderheads began to pop up just ahead of the cold front near the Mississippi River. In the east-central Mississippi town of Winston, the southerly winds intensified and began veering toward the west-northwest. Rain came in fits, accompanied shortly thereafter by quarter-sized hail. As the precipitation abated, sharply shifting winds and a dull roar announced the arrival of the day’s first tornado. The twister destroyed two homes and a cotton gin before lifting near Louisville. Just before noon the first killer tornado barreled through the town of Columbus. Several plantations were destroyed and one woman was killed. The tornado continued its 25-mile track across the state line into Pickens County, Alabama. At 12:20pm CST, the first violent tornado of the day touched down near Oxmoor, Alabama. The tornado tracked just southeast of Birmingham before tearing through the southern and eastern sections of the industrial town of Leeds. At least thirteen lives were lost, including four members of the Pool family, as dozens of homes were scattered in the howling wind. Newspaper reports suggest the tornado may have had a multi-vortex structure, with eyewitnesses stating that “several black shafts darted in quick succession from the cloud toward the earth.” Survivors of the tornado recounted that much of the town was left unrecognizable. Well-constructed brick homes in the area were leveled and several foundations were damaged or swept away, indicating probable F5 damage. Bodies were found impaled by various objects, and cattle and horses were reportedly skinned and dismembered. Eleven fatalities were recorded in the Leeds area. Thirty one were reportedly “gravely injured,” though the lack of subsequent reports makes it unclear how many ultimately succumbed to their injuries. Drawing of an obliterated farmhouse near Leeds, Alabama. Artist unknown. By 1:00pm, the outbreak was nearing its peak as a broken line of supercells sprawled across much of the southeast. A small funnel descended into a field near Cartersville, Georgia. Racing to the northeast, the tornado rapidly intensified as it neared the community of Waleska. Three children were killed after they had been released from school early and taken shelter in their home. At the towns of Cagle and Tate in Pickens County, many homes were completely swept away. The majority of the affected homes belonged to prominent families and were large and well-built, indicating that this tornado, too, was perhaps of F5 intensity. The tornado and associated downbursts cut a swath nearly three miles wide through the forest, leveling homes as far apart as two miles. The bodies of several of the 22 total fatalities were reportedly carried more than half a mile. In total, the tornado and associated downbursts flattened at least 50 square miles of forest. In East Alabama, what would prove to be perhaps the deadliest tornado of the outbreak descended from the skies just north of Jacksonville. The tornado tore through the Germania tanning yard before killing ten just north of Piedmont, then known as Cross Plains. As many as 20 lives were lost at Goshen, where a schoolmaster and six children were killed in a schoolhouse said to have been “blown to atoms.” All 19 of the remaining children were seriously injured. Large cotton bales were tossed at least half a mile, and many poorly-built homes vanished entirely. At Cave Spring, Georgia, four lives were lost and a number of well-constructed homes were scoured from the Earth. By the time the tornado had come to the end of its 35 mile path of destruction in western Georgia, it had taken more than 35 lives. Newspapers of the day made little effort to document the carnage in these rural communities, and the true death toll was likely much higher. Shortly after 3:00pm, large hail — some three inches or more in diameter — began falling across central Georgia. The wind veered from south to northwest and the temperature began to drop. Moments later, a large multi-vortex tornado began shredding and snapping trees in Monroe County. Just northwest of Haddock, many large homes were swept away and at least eleven people were killed. Unconfirmed reports indicated at least an additional 12 fatalities. Among those killed were a mother and her four children, who had taken shelter inside their home as the storm approached. Witnesses north of Macon recounted that the tornado contained “multiple dark columns rotating about a common center.” Another 50 were injured along the 30-mile path. At 8:30pm the final violent tornado of the outbreak began a path of destruction in southeastern Anson County, North Carolina. Two were killed and several homes were destroyed in Pee Dee. The tornado barreled through the southeast edge of the city of Rockingham. Several large homes were swept from their foundations, and large hardwood trees were reportedly debarked, denuded and snapped off near ground level. At least one victim in the area was reportedly thrown nearly a mile. The tornado intensified and widened to nearly one mile as it roared to the northeast. 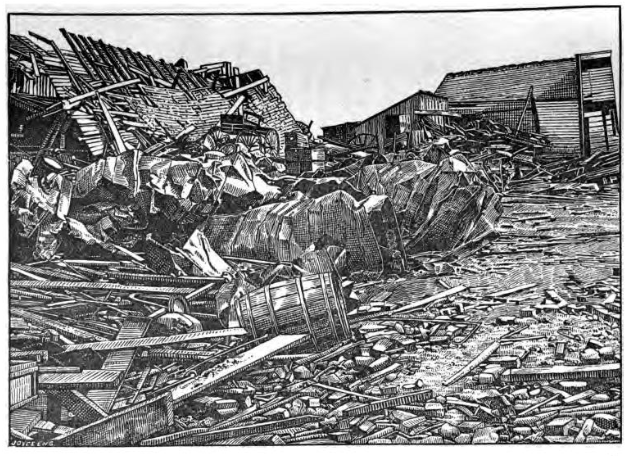 The small railroad community of Philadelphia, about three miles northeast of downtown Rockingham, was completely obliterated, with one observer noting that only “fragments remained of the houses and cabins.” At least 25 homes were razed to their foundations, their debris scattered over large areas. At least 15 residents of Philadelphia were killed in the storm. In total, multiple waves of tornadoes scoured at least ten states across the Midwest and Southeast. Mississippi, Alabama, Georgia, North Carolina, South Carolina, Illinois, Indiana, Kentucky, Tennessee and Virginia were all impacted by tornadoes and destructive winds. The enigma, however, begins with the final number of tornadoes — although the official number ranges from 47 to 60, the Enigma Outbreak may actually have been among the largest in history. The extent of tornado-related damage is uncertain, but is suspected to have been several million dollars, the equivalent of perhaps $100 million today. More than 10,000 structures were destroyed. The final death toll, too, is a complete mystery. While the conservative estimate is 178 — a terrible toll in its own right — many estimates have placed the final number as high as 1,200. A further 2,500 may have been injured during the outbreak. The system produced more than 37 significant tornadoes (F2 – F5) during its 15-hour duration, ranking it still among the most violent outbreaks on record. 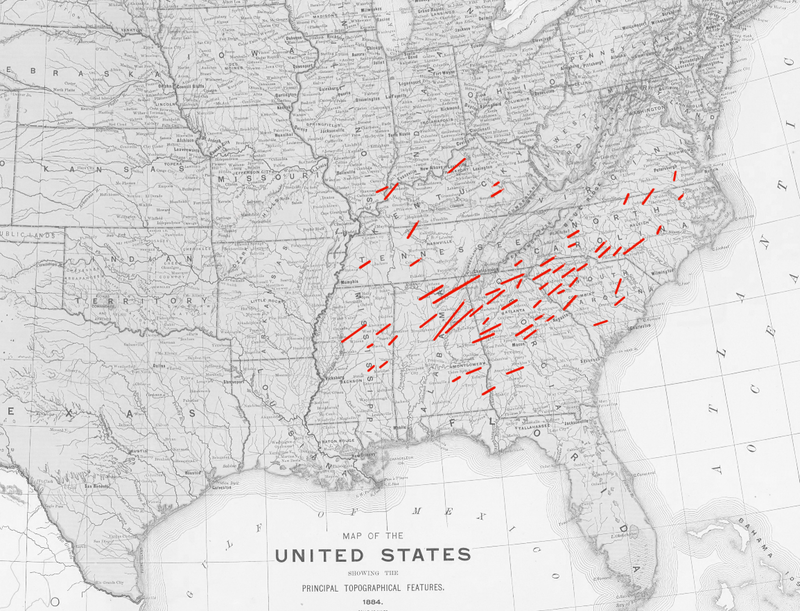 Map of all reported tornadoes during the Enigma Outbreak. Note that the northernmost tornado tracks may actually have been downburst damage. It is likely that there were many more tornadoes that simply went unreported, and some tracks may have been tornado families. In the days leading up to the event, despite a recently enacted ban on the word “tornado” and a halt to nearly all research and forecasting, an intrepid scientist named John P. Finley worked diligently to record surface and atmospheric data and attempt to piece together the puzzle of tornado outbreaks. 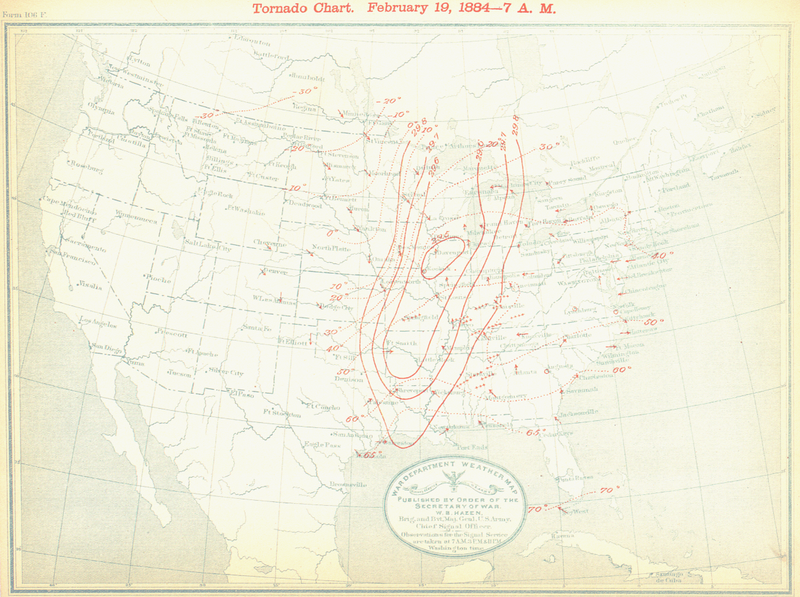 Finley developed meticulous tornado charts to track what he believed to be the most significant factors in tornado formation, including temperatures, dewpoints, dewpoint depression, wind direction and observed conditions. 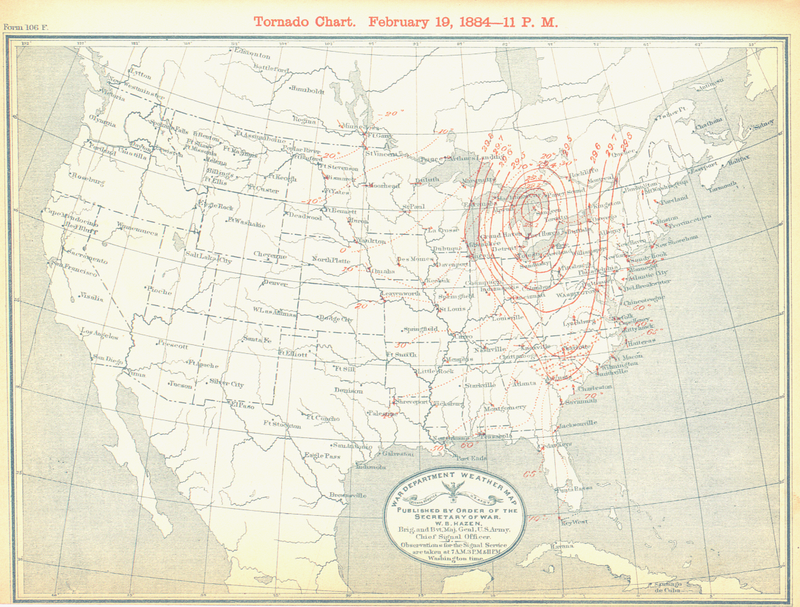 In his chart for the morning of February 19, seen below, he noted what he believed to be one of the most important indications of a tornado outbreak. A bulge of dry air, now referred to as a dryline bulge, was being pulled from Texas and Louisiana and forced into an area of warm, moist air overlaying Alabama and Georgia by strong easterly mid-level winds. This phenomenon is still used today to diagnose an enhanced tornado threat. 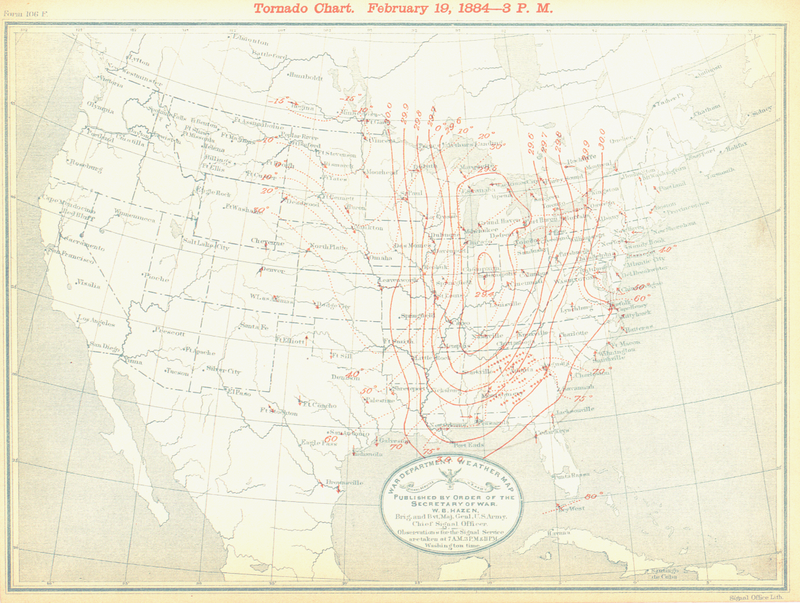 “Tornado chart” created by John P. Finley on the morning of February 19. Dewpoint isolines indicate a bulge of dry air from Louisiana cutting into the existing tongue of moist air over Alabama and Georgia, boosted by a strong southerly low-level jet. 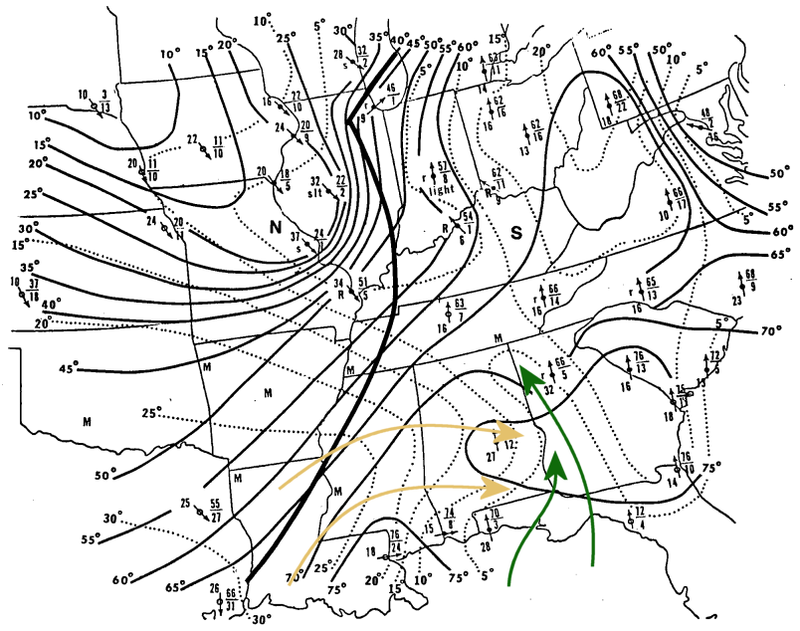 Added arrows represent dry air intrusion (orange) and moist air surge (green). Because of the extremely dynamic nature of the storm system in place, a range of severe weather effects were experienced over a vast swath of the eastern United States. The upper Midwest was gripped by an intense blizzard, with gale-force winds and snowfall rates exceeding one to two inches per hour in some areas. Much of the Ohio Valley experienced the violent winds and torrential rains of a derecho, with widespread and severe non-tornadic wind damage. Thousands of trees were “prostrated by the extreme wind,” and telegraph communications were cut off for several days. Across the Ohio Valley, the Ohio River and its many tributaries had already spilled over their banks. The additional rainfall from the storms of the 19th and 20th led to flooding which exceeded all records. Homes were swept away by deadly floods in Louisville, Kentucky; Jeffersonville, Indiana; and many other towns along the Ohio and its tributaries. At Union Point in Greene County, Georgia, hail fell in such volume that the ground was covered to a depth of three inches. Though the true extent of the Enigma Outbreak have been lost to the ravages of time, it still stands among the most widespread and violent tornado outbreaks in history. The tornado which struck Philadelphia and Rockingham remains the deadliest tornado in the history of North Carolina. Limited newspaper resources and shoddy reporting also makes it difficult to place this outbreak historically. Damages and deaths in rural areas were very poorly reported, and the deaths of African-Americans were not counted nor recorded. Given the large African-American population in the affected areas, it’s likely the death toll was much larger than the officially accepted number. The nickname is certainly well-deserved, and the many mysteries of the Enigma Outbreak will continue to draw intrigue well into the future. As anyone who has ever watched a local television meteorologist can tell you, the weather isn’t always easy to predict. The atmosphere is a maddeningly complex, chaotic system, and even the best forecasts involve some level of uncertainty. Fortunately, the basic mechanisms of the weather are relatively well understood, even if the results aren’t always predictable. The goal of this Meteorology 101 series is to provide a basic understanding of those processes, which will aid in the ability to forecast the weather and diagnose it as it happens. Although we generally don’t recognize it, we live at the bottom of a vast ocean. Unlike the liquid water that makes up the oceans we’re familiar with, however, the Earth’s atmosphere is composed of many onion-like layers of air. This air, despite being a gas rather than a liquid, still behaves in much the same way as any other fluid. This invisible ocean of nitrogen, oxygen, argon and other trace gases flows, compresses, pools and deforms as it travels around the Earth, and the science of meteorology is an attempt to understand and predict these motions and their results. As with any fluid, the atmosphere constantly seeks stability. In an ideal world, the air would be the same temperature and humidity throughout the entire atmosphere. Of course, we don’t live in an ideal world. Solar radiation, the rotation and tilt of the Earth and other factors ensure that stasis is never reached. The weather can be thought of as a great engine which seeks to rid the atmosphere of this imbalance and return it to a state of equilibrium, and throughout this series we’ll look at various ways in which it does this. But first, let’s examine how this imbalance originates. Although the atmosphere is a continuous body of air, it is composed of many smaller air masses. An air mass is a volume of air that has roughly the same temperature and moisture content throughout. There are four primary types of air masses, named by where they originate. “Continental” air masses are so-named because they originate over large land masses, and they tend to be drier. “Maritime” air masses originate over large bodies of water and tend to hold more moisture. These air masses are further defined by their temperature, with “tropical” air masses having a higher temperature than “polar” air masses. Taken together, the four air mass types are continental tropical (cT), continental polar (cP), maritime tropical (mT) and maritime polar (mP). A fifth air mass, continental arctic (cA) contains dry, bitterly cold air and is seen much less frequently in the middle latitudes. 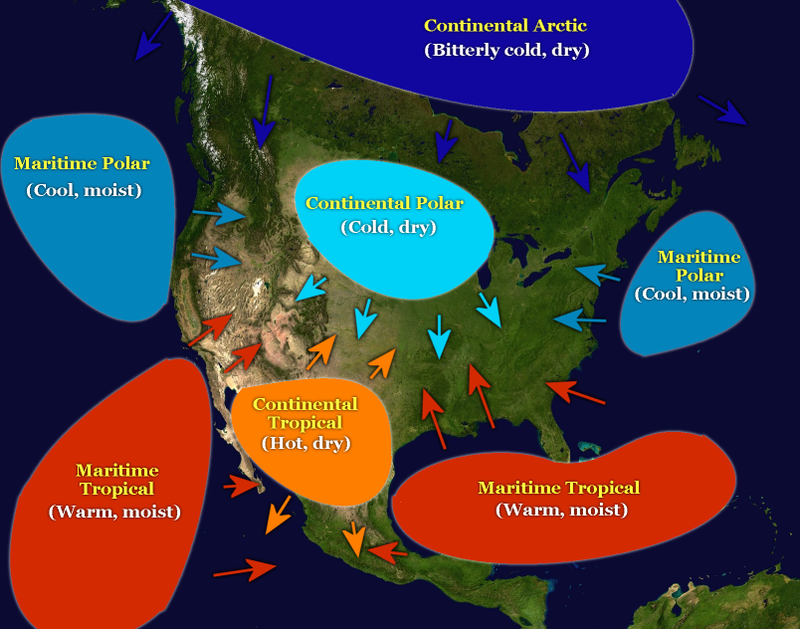 Common positions of the various air mass types across North America. Arrows represent the most common directions of flow for each air mass. These air masses move like large tectonic plates across the globe and, like the earthquakes that result from the collision of two plates, most large-scale weather occurs when two air masses collide. The meeting of two air masses is called a front, and the type of front depends on how the air masses are interacting. Because the majority of widespread weather occurs near fronts, they are a key factor in understanding and forecasting storms. Below are the types of fronts as well as the weather that is normally expected along them. Below each header is the symbol used for each front on surface analysis maps. Cold fronts occur when a mass of cold air moves into and collides with an existing mass of warm air. Because cold air is denser than warm air, the cold air mass drives underneath the warm air mass like a wedge, lifting it higher into the atmosphere. The warm air mass eventually rises high enough to begin condensing, forming clouds and rain. The cold air strongly forces the warm air to lift upward, often leading to thunderstorm development or heavy snow in the winter. 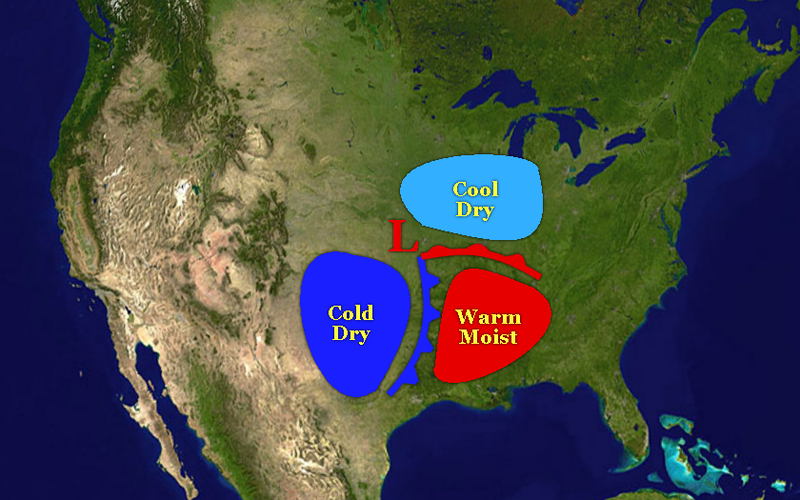 For this reason, the majority of severe weather occurs near cold fronts. A warm front occurs when a warm air mass moves into an existing mass of cool air. Because the warm air is already in motion and the cold air is stationary, the warm air lifts above the cold air with much less force. This leads to much less energy for storm development and often causes steady, prolonged rain and occasionally weak storms instead. Because warm fronts move much more slowly than cold fronts, rainy conditions generally persist for a longer period of time. When warm and cold air masses meet and neither has enough force to move the other, a stationary front is formed. Along the front, the lifting is very weak and storms are rare as a result. Because stationary fronts move very little, they can cause steady rain or snow over the same general area for many days. Many flooding and heavy snow events are caused by stationary fronts, which are sometimes referred to as being “stalled” over an area. An occluded front is the most complex of the various fronts. When a swiftly moving cold air mass overruns a slowly moving warm air mass, it can sometimes wedge completely underneath the warm air mass and begin mixing with the cool air on the other side. When this happens, the warm air mass is cut off from the ground, or occluded, and is is lifted further into the atmosphere. Weak lifting may cause widespread clouds, as well as rain or snow and occasionally storms. As we mentioned briefly earlier, one of the primary causes of the imbalance that drives the weather is solar radiation. Because of the tilt and rotation of the Earth, its surface isn’t heated evenly. This, in turn, causes the air masses above these cooler and warmer areas to also become cooler or warmer because the temperature of an air mass is determined largely by the temperature of the surface beneath it. In addition to contributing to the different thermal properties of the air masses, this uneven heating also influences the surrounding air pressure. Air pressure is essentially a measure of the weight or thickness of the atmosphere above any given point. A thicker volume of atmosphere is heavier because it contains more air molecules, and vice versa for a thinner volume of atmosphere. Temperature affects the pressure of a mass of air by expanding or contracting it. As a mass of air becomes warmer, it becomes less dense and begins to rise and expand. The air high in the atmosphere begins to flow away from the rest of the air mass as it warms and expands, leaving less air beneath and creating a lower air pressure. Conversely, a cooling air mass contracts and becomes more dense, allowing additional air high in the atmosphere to flow inward, adding additional weight to the air mass and creating higher pressure. As air rises in a low pressure system and flows outward high in the atmosphere, more air near the surface rushes inward to fill the void. This air is also ultimately lifted upward and dispersed, acting as an engine or pump that continues to run until the surrounding atmosphere is no longer imbalanced. The same mechanism works in reverse in a high pressure system, where air flows outward near the surface and more air rushes inward in the upper atmosphere. The air in the upper atmosphere then flows downward toward the surface, called subsidence, until it too eventually reaches the surface and flows outward. However, this inward and outward flowing air does not flow in a straight line. Combined with friction from the surface, the Earth’s rotation imparts rotational energy to the air, called the Coriolis force. The Coriolis force causes wind to be deflected, imparting rotational energy. 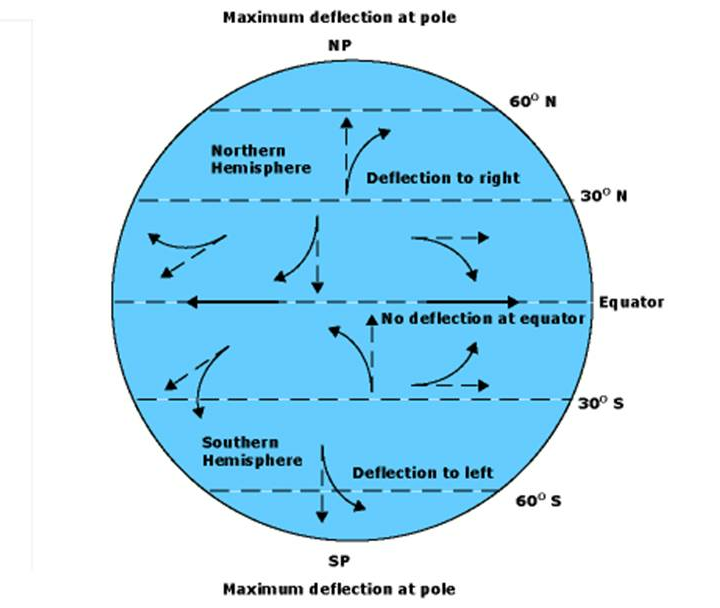 The diagram shows the direction of rotation for each hemisphere. Since low pressure areas cause air to be lifted higher into the atmosphere and high pressure areas cause air to sink, low pressure is generally associated with clouds and stormy weather while high pressure normally brings fairly calm, clear weather. Although high pressure areas play an important role in the weather, low pressure systems are of most interest for our purposes. A typical low pressure system consists of a cool air mass to the north, a warm, moist air mass to the south and east and a cold, dry air mass to the west and northwest. In an effort to maintain stability, the warm, southeastern air flows toward the north and the cold, northwestern air flows to the south. This setup creates a warm front to the east of the high pressure and a trailing cold front to the south. A typical low pressure system with its associated air masses and fronts. The air from each air mass flows inward toward the area of lowest pressure, indicated by the “L” on the map. One final piece that often plays a role in severe weather, particularly in the Great Plains, is a dry line. 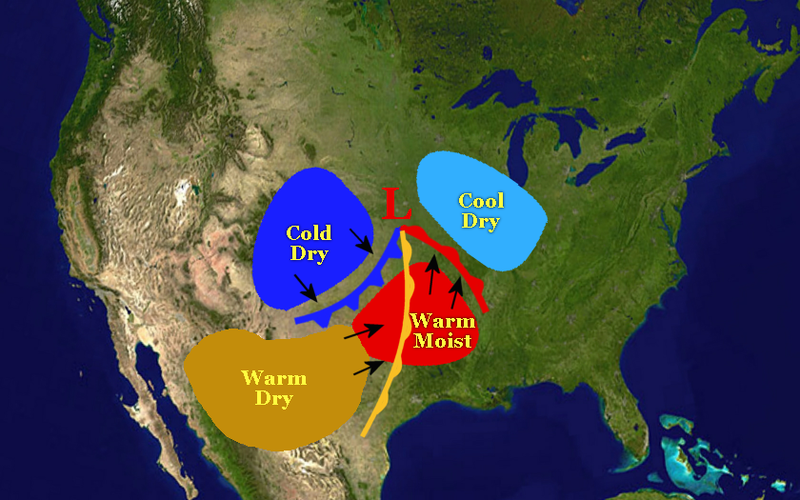 A dry line is a semi-permanent boundary that often separates the warm, moist air mass across the southeastern and central United States and the hot, dry air mass originating from the desert Southwest and northern Mexico. The boundary between very moist air and very dry air often serves as a focal point for severe weather when low pressure systems pass through. A low pressure system with a typical dry line, seen here in light orange. Now that we have an understanding of the large-scale forces (called “synoptic scale”) that factor into the weather, we’ll look at the smaller-scale forces (called “mesoscale”) that factor into storm development in the next installation.